(Dr. Dushni Weerakoon) China holds approximately 9% of Sri Lanka’s total outstanding debt as of 2017, and 14% amongst bilateral lenders – equivalent to the same share held by neighbouring India. Despite this, Sri Lanka’s engagement with China has become synonymous globally with the Asian giant’s so-called ‘debt diplomacy’ – an euphemism for debt entrapment. As Sri Lanka, like many other developing countries, escalates its engagement with China’s ambitious Belt and Road Initiative (BRI), the question of debt entrapment requires a more rigorous review. A decade on from the Hambantota Port project’s kick off – a China-funded venture that is illustrated globally to support the debt entrapment hypothesis – when Sri Lanka is grappling with a worsening foreign debt overhang, seems a propitious time to examine some of the numbers. From a debut USD 500 million international sovereign bond (ISB) issuer in 2007, Sri Lanka has gone on to amass USD 15.3 billion during 2007-2018 from subsequent ISB issues and foreign currency term financing facilities (FTFFs). In the same period, Sri Lanka tapped China for a total of USD 9.2 billion as development loans, and an additional USD 1 billion as a FTFF in 2018. 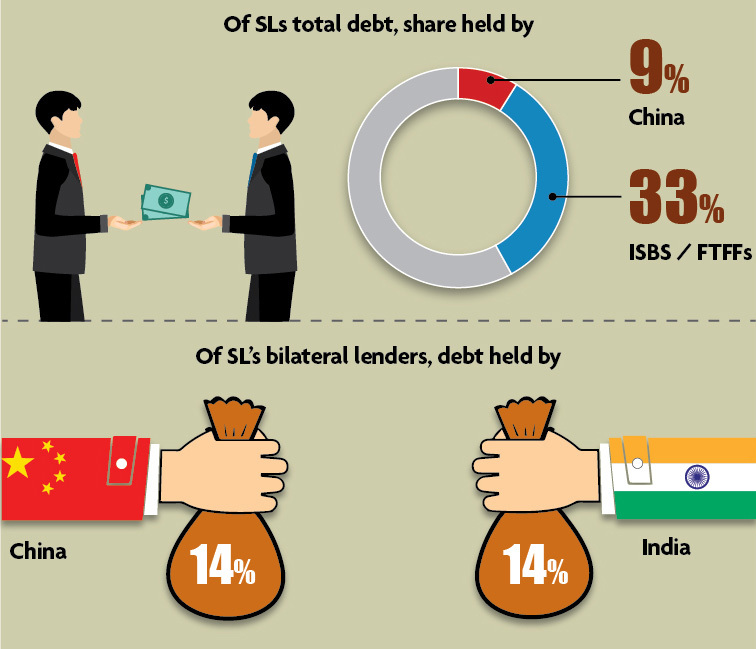 Not surprisingly, ISBs and FTFFs together account for 33% of Sri Lanka’s outstanding foreign debt in 2017, against a 9% share held by China. Criticism of Chinese loan disbursements have focused not only on the volume of funds, but also on the terms. Indeed, the Hambantota Port saga centres on this theme – funding for phase 1 of the project (USD 307 million), costing Sri Lanka a fixed rate of 6.3%, when globally, rates were declining rapidly following the global financial crisis. But when considering the total USD 9.2 billion Chinese development loans to Sri Lanka, 61% has been obtained on concessional terms, according to data available from the Department of External Resources. Concessional terms on Chinese loans are typically fixed rates at 2%, with other fees of 0.5% and maturity periods of 15-20 years. The terms compare less favourably to Sri Lanka’s other major bilateral donors – India, but most specifically, Japan. However, in comparison to raising ISBs or FTFFs, tapping China can be more price advantageous, with possibly more flexibility on loan rescheduling if required. 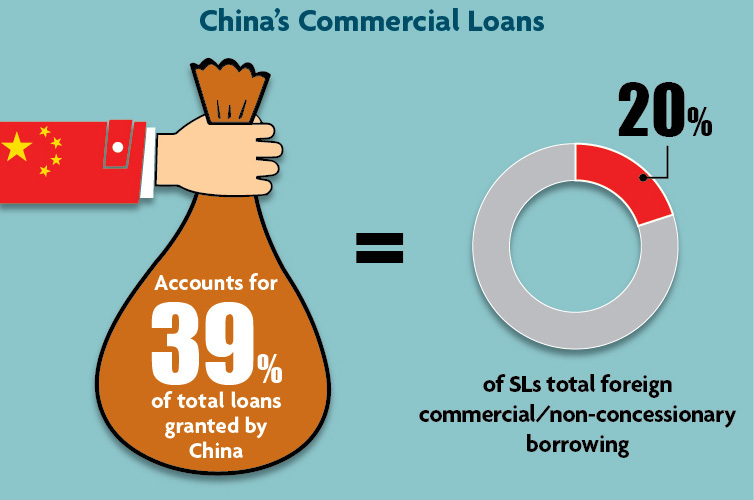 If only 40% of loans from China has been obtained on commercial terms, they account for only 20% of the country’s large and rising non-concessional share of foreign debt (at 55% of total outstanding debt in 2017). The vast bulk (80%) is made up of ISBs, FTFFs, and foreign holdings of Treasury bills and bonds. This shift in composition has been the main driver of Sri Lanka’s rising debt service ratios, where Chinese development loans have played a very secondary role. Thus, Chinese loans are clearly not the primary cause of Sri Lanka’s debt imbroglio. But, they have contributed to, and possibly aggravated, the problem. Loans from China are attractive to governments for multiple reasons; they are free of conditions and lengthy negotiating processes, and provide access to large volumes more quickly, to be disbursed according to presumed needs. In the event, they also carry heavy risks in the presence of poor analysis of investment projects, incentive problems, and interest group influenced investment choices. With much of Chinese development loans plugged into infrastructure projects with relatively low financial returns over the long term, and policy inaction to deal with declining export competitiveness, Sri Lanka turned to ISBs for reserves accumulation – at times spending large chunks defending the currency against all odds – and debt servicing. As a result, the returns on ISB/FTFF are likely to be considerably lower than their borrowing costs. The more prudent course when simultaneously issuing long term bonds and buying reserves with ISBs, is to accumulate resources to be used in periods of higher borrowing costs. Under the circumstances, net of debt settlements, Sri Lanka’s external debt exposure keeps growing. The risks from the exposure to a large external debt stock are multiplying as the favourable external financial conditions under which Sri Lanka borrowed excessively starts to unwind.To a large extent, these pressures will also dictate future engagements with China. A shift is already taking place, as Sri Lanka increasingly taps China for FTFFs. With narrow financing options for low middle income countries, there is much to be gained from active engagement with the BRI. But, the risks too must be better managed. Safeguards on project appraisal and selection, and strong national debt management practices are essential for countries like Sri Lanka to safely navigate the new financing landscape. Dr. Dushni Weerakoon is currently the Executive Director of the IPS and Head of Macroeconomic Policy research at the Institute. She has over 23 years of experience at the IPS, and functioned as its Deputy Director from 2005 to 2017. Since joining the IPS in 1994, her research and publications have covered areas related to regional trade integration, macroeconomic policy and international economics. She has extensive experience working in policy development committees and official delegations of the Government of Sri Lanka. She holds a PhD in Economics from the University of Manchester, U.K. (Talk to Dushni – dushni@ips.lk).